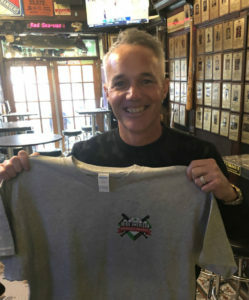 Chicago White Sox coach and former MLB player Joe McEwing proudly displays his Irish American Baseball Society T-shirt. Chicago White Sox bench coach and 8-year MLB veteran Joe McEwing joined the Irish American Baseball Society last week. McEwing, who played for the Cardinals, Mets, Royals, and Astros, joined during a visit to the Irish American Baseball Hall of Fame in New York City. Played professionally for 16 seasons, including nine in the major leagues with St. Louis (1998-99), New York-NL (2000-04), Kansas City (2005) and Houston (2006)…Hit .251 (443-1,767) with 25 home runs and 158 RBI in 754 major-league games…Finished sixth in the National League Rookie of the Year balloting in 1999, batting .275 with 28 doubles, nine home runs and 44 RBI in 152 games with the Cardinals…Appeared in 11 games with the Mets during the 2000 postseason as the club reached the World Series … hit .283 (80-283) with eight homers and 30 RBI with the Mets in 2001. McEwing is the latest MLB veteran to join the Irish American Baseball Society. He joins Steve Garvey, Eric Byrnes, Don Larsen, and Rob Delaney.